So I’m back in East Lansing qgain, wandering around Michigan State University. 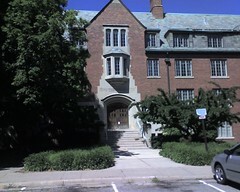 This was my old dorm when I was an undergraduate. I loved it here, it was a really small building (about 250 people) and it was a lot more comfortable than those big buildings. http://GarySaid.com/williams-hall-msu/ generated Wednesday, April 24th 2019 at 10:44:30 am EDT (in 85 queries in 0.919 seconds).